Although the Aztecs were fully aware of the existence of the ancient metropolis of Teotihuacán, (indeed they believed the sun itself was created there), they attributed the heroic saga of a man-god called Quetzalcoatl, or Plumed Serpent, to a remote early PostClassic city-state called Tollan or Tula meaning Place of Cattail Reeds, one of the successors to Teotihuacáns hegemony over the Basin of México. Tulas main ceremonial precinct was the administrative center for a surrounding city of over 30,000 people. The Toltec people were comparatively rich and lived comfortably in large single story flat-roofed compounds of up to five houses each. Construction was largely of earth and stone with adobe being applied as a finishing. There was an overall grid plan defining distinct barrios and suggesting a master design conceived by highly coordinated municipal authorities. nowhere was too distant for them to journey. A distinct foreign ware called Tohil plumbate had always been recovered in relative abundance at Tula, but it was only in the 1970s that archaeologists confirmed its source to be distant Chiapas and Guatemala. 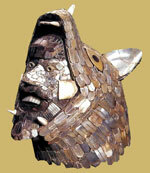 Even more remarkable was the discovery of Nicaraguan polychrome called Papagayo. Whether local imitations to celebrate achievements in distant trade, or precious gifts literally transported for over a thousand miles, these fragile artifacts bear testimony to the Aztec legends. Pyramid B is an imposing structure measuring 120 feet square and over 30 feet high. At the summit were erected the remarkable four and a half meter high atlantean columns that once supported the roof of a great temple. Standing at attention with their spearthrowers held to their sides, the warlords sport jeweled mosaic helmets topped by feather crowns and butterfly-shaped breast plates. Bits of surviving color indicate that they were painted to represent either the great Tolteca-Chichimeca warlord Mixcoatl, Quetzalcoatls father, or the Morning Star god, Tlahuizcalpantecuhtli. Narratives related to those gods are also found in the friezes of jaguars, coyotes, and eagles that once extended around all four sides of the pyramid as well as the wall that enclosed the north side of the pyramid. According to legend, Mixcoatls followers were served food and drink by the wild animals, during fasts they were required to make prior to being initiated as Toltec nobility, while the Morning Star god is featured on the Coatepantli as the fleshless being emerging from the jaws of a rattle snake. Click on Image for more detail. A magnificent jaguar-helmeted warrior was first modeled in clay, fired, and then inlaid with mother-of-pearl traded from as far away as the Gulf of California. Tula will always be somewhat enigmatic to scholars because of its development in such an isolated area of the Basin of México. Re-evaluation of the Toltec power base as being mercantile and messianic and not imperial, has led a number of scholars to examine Tulas relationship with western and northern México, vast arid lands occupied by Chichimec peoples who could supply enormous amounts of rare materials being traded on the Pacific Coast such as malachite, cinnabar, hematite, rock crystal, copper, spondylous shell, and turquoise. Click on Image for more detail.